One of my favourite past times is to go to garage sales, car boot sales and charity shops and find items which I can alter. This next project is one of those. 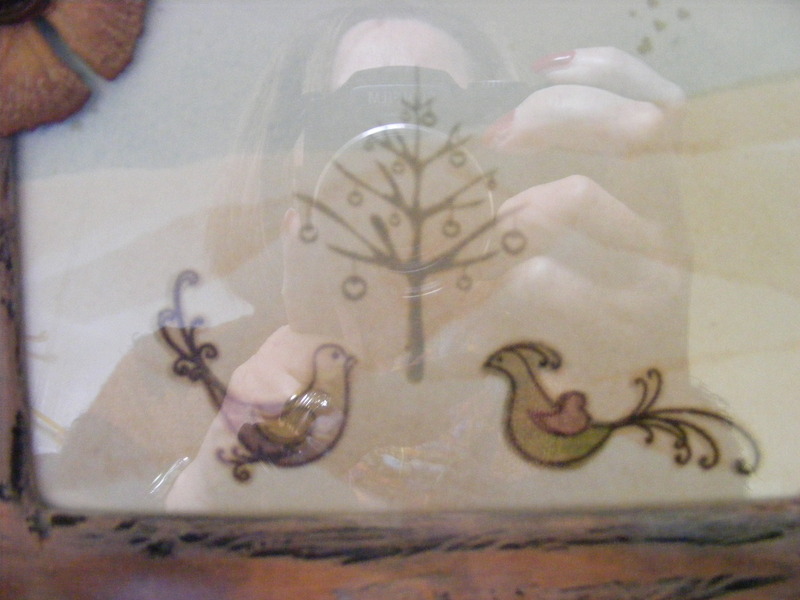 The photo frame was a silver plated battered old thing but the back was in good order. So at the same time that I distressed the suitcase, I went on to distress the photo frame so I would only be clearing up once. If you are using acrylic paint you must give your brush a good wash after use, as once dry you will never get the paint off and have to throw it away. The technique used to distress the photo frame is the same as the suitcase. Pebeo paints in black, ash brown and antique white. Distress inks in black soot, walnut stain and dusty concord . Label and tassel from purchased top, covered in backing paper. Heartfelt creations ‘carnation creations’ die template and stamps. Silicone mould used for cake making-buttons. Watercolour paints and piece of watercolour paper. WOW ‘is it a bird’ clear stamps. Start off with black acrylic paint and paint all over the frame. Acrylic paint will usually stick to anything. Heat set. Then a layer of PVA glue. Straight away put a layer of ash brown and antique white on top, then heat causing the PVA glue to shrink and distress the top layer. When cool I then got a piece of kitchen roll and rubbed the frame lightly, taking off some of the top layer of paint making it distress even more. I then took my distress inks and with a piece of cut and dry foam dotted colour in different places on the frame then rubbing in off with the kitchen roll. Leave to dry. I then stamped the heartfelt carnation onto white card stock with walnut stain distress ink then quickly poured clear embossing powder over the top and heated. I then went over the flower in watered down walnut stain, shading in places. With a pair of scissors I then curled the flowers. With the small flower on the tag I added dusty concord as a shading colour and the pearl button as a centre. I then cut a piece of watercolour card the same size as the inner frame behind the glass and used blues and brown watercolour paints very diluted to give an effect of sky and fields on the card stock. I then stamped the love tree with london fog in the middle of the piece of card. I then stamped the birds onto different background papers that toned well with the watercolour background and frame, then decoupaged these onto the watercolour card. In either a melting pot or a small tin foil pie dish, I heated up 3 teaspoons of ultra thick, 1 teaspoon of indigo and 1/2 teaspoon of burgundy embossing powder. Once melted, I poured the mixture into the button moulds and let it cool off. 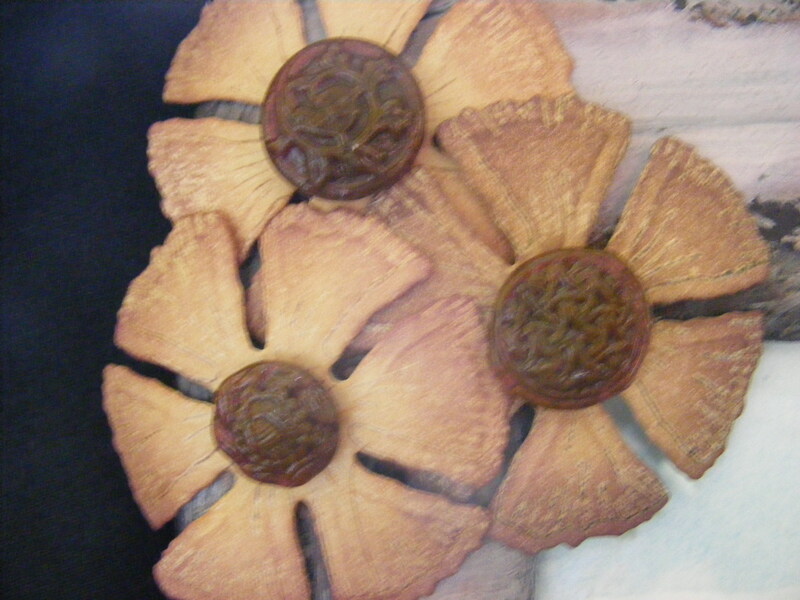 I then took the made buttons out of the moulds and glued them onto the flowers as centres. 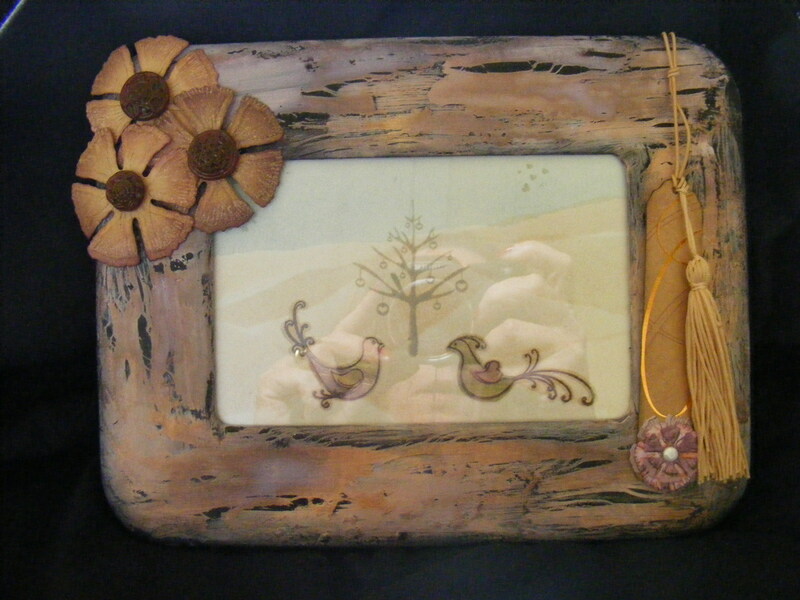 I then put the frame together adding the flowers to the left hand side and the tag to the right hand side of the frame.